The planet hieroglyphs are a type of astrology shorthand, learning the origins of each symbol allows you to gain a better understanding of the energy behind each planet and how it affects you. The Sun: The outer circle represents infinity and the dot in the middle stands for a will to exist. The Sun’s principles are: self-development, uniqueness and character. As a focal point in horoscopes it is central to personality. It is about what makes us – us! It directs our self-confidence and self-esteem, our spirit and creative energy. The Moon: The symbol behind this planet represents the soul, as well as darkness and night, it is feminine in energy. Mostly the Moon deals with our reactions, but is also keeper of our memories. The waxing and waning of the Moon is representative of our changing mood as we alter phases, it is about emotions and instinct. 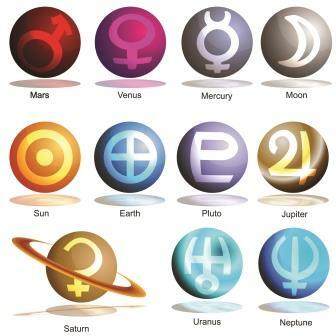 Mercury: The meaning behind this symbol is split, a) a receptor for the mind, and b) the force behind the mind. As a whole Mercury deals with your thought processes and how you communicate, it is all about perception and a logical mind. Venus: If you consider the Sun and the Moon as parents, then Venus would be the daughter. This planet is all concerned with relationships, harmony and unity. It is recognised as a symbol for women, and is sensual, romantic with a love of beauty, but ultimately togetherness is its goal. Mars: “Women are from Venus, men are from Mars,” or so the saying goes, so Mars is the male energy is this partnership. In astrology, it demonstrates braveness, ambition, initiative and strong energy. The symbol represents procreation and potency and being ready for action. Jupiter: Is the largest planet in our solar system and as such has some of the grandest concepts – abundance, universal laws and philosophy… From an astrological standpoint it is the ruler of spirituality and higher-learning. The symbol is about the soul’s journey on this earthly plane. Saturn: In contrast to Jupiter, Saturn is the last planet that we can see with the naked eye. Its energy is draining, it is all about limits, staying within a system and having boundaries. As a symbol it is considered ‘the end’. It represents hard work, knowing when to make compromises, commitment and ultimately ‘what must be overcome’. Uranus: At the heart of Uranus is truth and freedom. It celebrates individuality and innovation. Its symbol is about tuning in – finding insights, and a link between humankind and the divine. In terms of horoscopes a person may show rebellion, but also genius and forward-thinking. Neptune: Sacrifice is the overriding symbol of Neptune. There is a quest for enlightenment – a search for the ‘Holy Grail’. In contrast to Saturn – here boundaries are not welcome. It is about encouraging a certain amount of chaos, of escapism – being swept away by ideas. The focus in horoscopes is of dreamers, full of empathy and compassion. Pluto: In Pluto there is a re-newer, the symbol is about the cycle of life, from birth, to death to rebirth. It has powerful principles, of survival and regeneration – it will triumph! Of course it is also associated with the underworld and as such secrets and darkness are part of its makeup. Within the context of horoscopes it is ruthless and empowered.